In my last blog, I discussed new delivery models for primary health care. I listed several states where Medicaid was considering the new delivery options of accountable care organizations. (ACOs). My own state of Pennsylvania was not on the list. But this week, all that has changed with the announcement of two aggressive initiatives to seek out new health care delivery models and payment reforms. Followers of this blog have read all of the ways that optometry can easily provide the clinical care to participate in these health reform demonstrations. The problem has been getting the information about our services to the proper decision makers and creating the logical models of care delivery that include optometry. As a health care consultant, I have had the opportunity to develop several of these models for various clients around the country. I am providing a rough outline of several of these models to stimulate some creative thinking among my readership. The first model that I developed along these lines is the multidisciplinary PCMH. In this model, optometrists, along with dentists, podiatrists and psychologists, participated directly along with a centrally located primary care physician (PCP) in a risk-sharing capitated delivery model. Essentially, it was a staff model health maintenance organization without walls featuring electronic medical record (EMR) connectivity. In another model called the expanded PCMH network, optometry practices were organized in “primary care pod,” where a PCP practice is surrounded with one to five optometry practices to expand the reach of the PCP to the healthy population with refractive errors. This model was developed to service the health care exchange market where routine eyes services are mainstreamed into the basis health benefit. In a newer version of this model, a physician assistant or nurse practitioner is housed in the optometry practice with joint clinical responsibilities for primary health care and ocular disease management. These are only a couple creative examples of how to practically integrate eye services and primary health care services. For optometrists who have worked in a staff model HMO, in a hospital or within the Veteran’s Administration, these relationships and synergies are obvious. 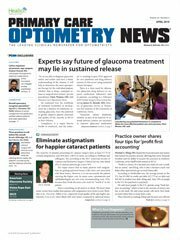 For optometrists in private practice, these concepts may seem unusual or too futuristic. The more that I learn and read about health care reform initiatives around the country, the more convinced I become that this is the right direction for optometry and that the time is now to get involved. The Pennsylvania story noted today is just an example of the kinds of opportunities that have been ushered to the forefront with the Accountable Care Act. I will certainly be meeting with the leaders of this new initiative in Pennsylvania to discuss some of the optometry models presented above. I urge each optometrist to follow the news and the health care trends in your state and take the opportunity to spread the word about the potential that optometric practice can offer in achieving the principles of health care reform.